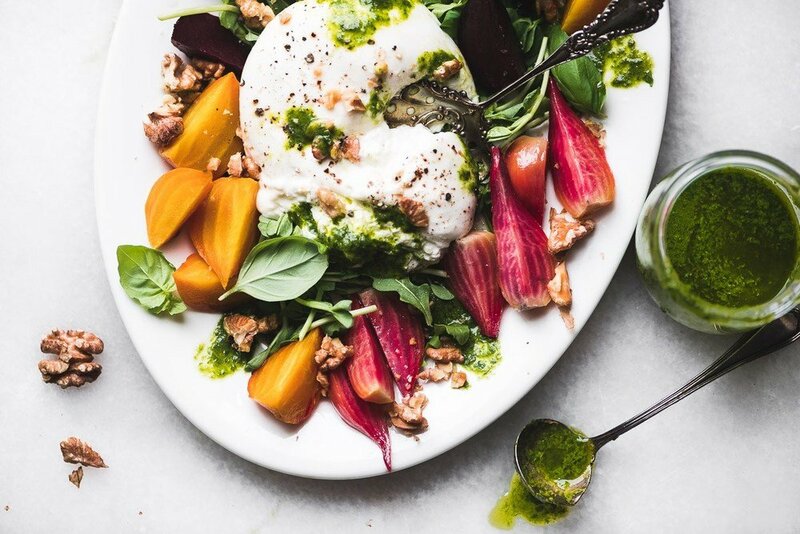 Roasted Beet and Burrata Salad with basil walnut oil ~ a healthy appetizer or vegetarian side dish made with colorful rainbow beets and creamy burrata cheese. Wash the beets and trim the stems to about 1 inch. Group them by size, and loosely wrap them in foil. Roast on a baking sheet for about an hour or longer, until a small sharp knife pierces the flesh easily. Smaller beets will take less time than the larger ones, which is why you want to group them by size. Let cool briefly before trimming the tops and removing the skins. If the skins don't peel off easily by hand, use a vegetable peeler. Slice the beets in half and then into wedges. Toss them lightly in walnut oil. While the beets are roasting, make the basil oil. Put the basil leaves and lemon juice in a food processor or good blender and process until broken down, scraping down the sides as necessary. Add the oil and continue to process until it becomes a smooth sauce. Add salt to taste, and more lemon juice if you like. If the sauce is still too thick, blend in more oil. To plate the salad, scatter some baby greens or micro greens on a platter and carefully lay the burrata down in the center. Try not to break the outer skin, but if you do, don't worry. Arrange the beet wedges around the cheese, and scatter with the crushed toasted walnuts. Drizzle the basil walnut oil over the salad, hit everything with some fresh cracked pepper, a pinch of salt, and serve.